Currently DZero, CMS, BaBar, MICE and the proposed MuCool, neutrino factory and muon collider. Cherenkov and Muon PID counters for charm and semileptonic studies (Fermilab Tagged Photon Lab and MICE). First UNIX computing farms and first acquisition system (E791) to write 10 megabytes per second to tape. Leadership roles in Silicon Microstrip Tracker construction, commissioning, software, operation, and W mass measurement (DZero). HCAL calorimeter contributions and GFLASH simulations, pixel cooling and controls (CMS). Upgrade path to accelerate leptons to 750 GeV in the Tevatron tunnel for use in the proposed MuCool, neutrino factory and muon collider experiments. The UEC Government Relations chair from Ole Miss organized more than 500 meetings with Congress and executive branch spanning the start of DOE Office of Science and NSF budget doubling. 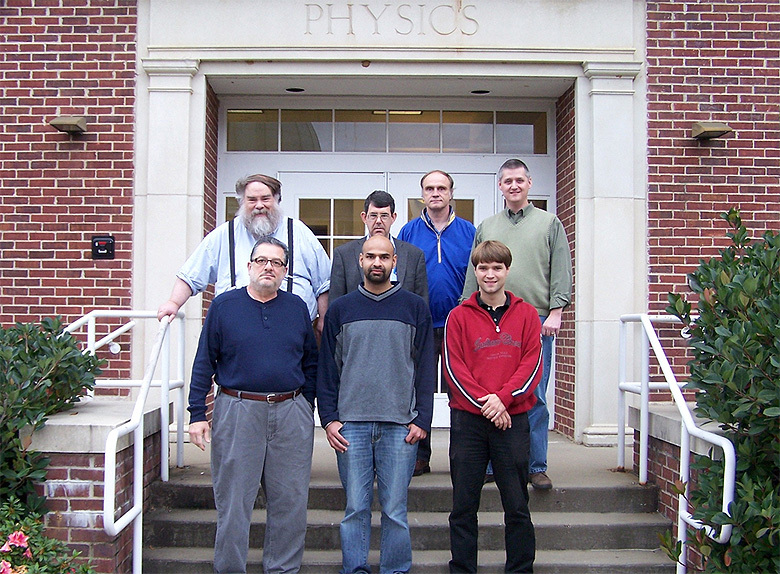 WHAT SETS PARTICLE PHYSICS AT THE UNIVERSITY OF MISSISSIPPI APART? Pioneering efforts in UNIX computing in high-energy physics, high-speed data acquisition and large data set reconstruction and Monte Carlo generation with offsite university farms. Department of Energy and National Science Foundation. 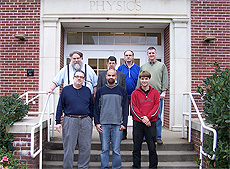 Back row, from left: Don Summers, David Sanders, Rob Kroeger and Breese Quinn. Front row, from left: Lucien Cremaldi, Sudeep Bhatia and Peter Sonnek.